One of the earliest stars of the French music hall, and the first to earn a huge salary, fame first came to Paulus as a result of a verse he sang about General Boulanger in 1886. He then worked almost continually in Paris and Marseille, and was well known for his powerful voice and delivery, presenting the character of a fashionably dressed boulevardier, singing of the joys of good-living and the importance of patriotism. 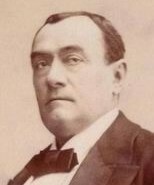 Paulus toured to London and the USA in 1891-2, and managed the Ba-ta-clan and the Marseilles Alhambra rather unsuccessfully before retiring in 1903. His brief meeting with the cinematograph came in early 1897 when he was filmed by Georges Méliès. This took place in the magician's 'laboratoire' near the Paris Opera, just before his studio was completed, and in order to film at all some thirty arc and mercury lamps were rigged up, one of the first times artificial light was used for cinematography. Paulus was filmed singing five of his songs, including Derriere l'omnibus and Coquin de Printemps, and these were then projected at his Ba-ta-clan theatre. The reasons for this project are somewhat unclear: by this time Paulus was aged and infirm, and it is suggested that the films would spare him performing live; but it is implied elsewhere that Paulus was planning to sing along with the films from behind the screen. In any case, according to Méliès, his appearance on the screen was greeted every night in the theatre by enthusiastic applause. He died in poverty having lost the remainder of his savings in a failed wine business.